GBP has been supported by the positive BBA Mortgage Approvals. 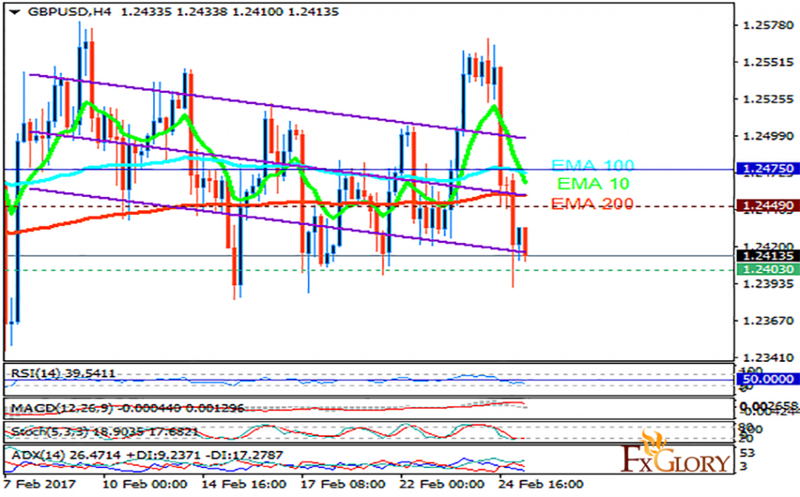 The support rests at 1.24030 with resistance at 1.24490 which both lines are below the weekly pivot point at 1.24750. The EMA of 10 is moving with bearish bias and it is below the EMA of 100 and above the EMA of 200. The RSI is falling towards the oversold area, the Stochastic is showing downward momentum and the MACD indicator is in neutral territory. The ADX is not showing any clear signals. GBPUSD has been moving with high volatility which makes it hard for traders to forecast the next target. At the moment GBPUSD will continue its bearish trend below the support area but soon will start its upward trend targeting 1.2550.